The Capital Wine School was started by Jay Youmans MW in 2008 with the goal of offering the highest quality wine education possible while keeping the classes fun and unpretentious. Their instructors are knowledgeable, experienced, and engaging. Capital Wine School’s motto is “seriously fun wine education.” Ummm, where do we sign up? Our client wanted us to focus on helping their clients figure out what course was best for them. They were also ready to upgrade their event management platform from Event Espresso 3 to Event Espresso 4 and needed their email subscriber platform to seamlessly integrate with their newsletter sign up list pop-up button. Our client also wanted us to comb through all their content so that only up-to-date and relevant content showed up on the new site. Most important, they needed a fresh design focused on making the whole experience more user-friendly and engaging for their clients. 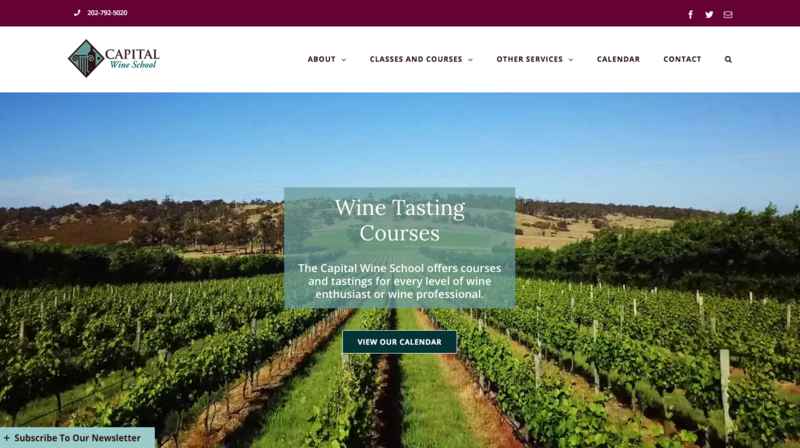 By collaborating closely with Capital Wine School, we did a major website overhaul as we condensed and reworked the website’s information so that only relevant and current information exists. We also revamped how the client talked about their courses and recategorized the way they marketed their classes. As part of this, we came up with a model targeting user’s experience level, promoting Beginner, Intermediate and Advanced categories. To keep users engaged, we included a mixture of content, including attention-grabbing icons, engaging articles, videos, and big imagery plus video featuring swirling wine and fields of grapes. We chose an easy-to-navigate interface and created new design focused on a creating a site experience that’s intuitive and easy to navigate. The result is a website that no wine lover could resist. Check out Capital Wine School.